Easy Butterfly Art Projects for preschoolers through second grade. For a neat looking butterfly. I cut the Ziplock part off but kept the other end together. let the kids paint one side of the bag then let it dry then wrapped a pipe cleaner around the center for the body and antennas. the kids loved doing it and the parents loved it. I had an idea for a Spring party and its where the teacher makes a large cutout of a butterfly or trace it on bulletin board paper and lay that out on a table and have the kids paint the butterfly with their hands. Give each child a sheet of paper, have the children color designs on them. Have them fold their papers accordion style. Take a long piece of yarn (about a yard in length. Tie in center of the accordion folded paper. Fan out the sides to make wings. Viola! The kids have their own butterflies that they can take and run around an open space and make them fly. Clothespin Butterflies: Have cups of water mixed with food coloring colors (red cup, blue cup, etc..) and have children dip eyedroppers into the different colors and squeeze onto coffee filters. Once the kids have ‘tie-dyed’ the coffee filter, let them dry. When they are dry, have kids scrunch coffee filters into milk bottle clothespins (look like wings) then place dots for eyes on the clothespin heads and wrap pipe cleaners around for antennas. Makes a beautiful craft and my preschool class really seemed to enjoy it. Buy all those pretty colors of Easter grass on clearance after the holiday! Then let the kids stuff little plastic baggies with a little of each color. Tie off with a pretty pipe cleaner and the kids have a really pretty butterfly! Take a piece of white construction paper and trace the child’s feet. Then fold the paper in half. Place a few drops of paint in the fold and fold the paper again, making sure to get the paint evenly over both folded sides. 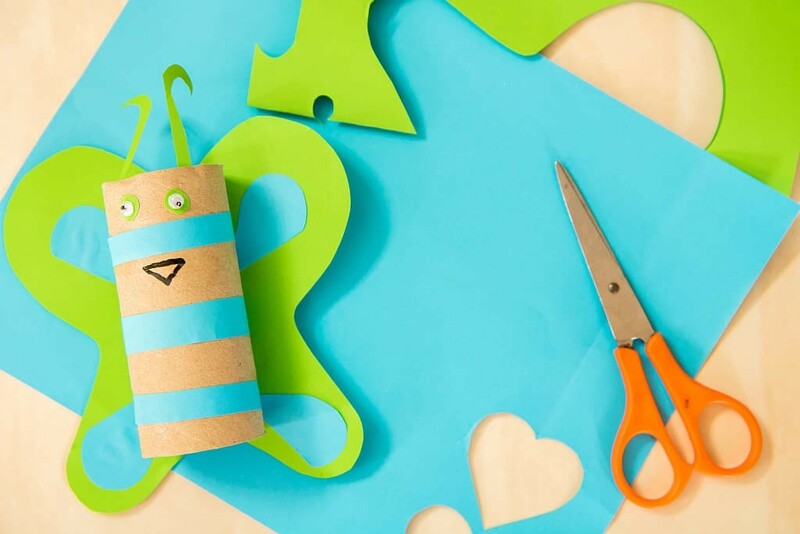 To make giant butterflies-fold very large pieces of paper in half…fill squeeze/sauce bottles with liquid paint (reasonably thick) Let several children squeeze paint onto one side of the paper, then fold and all squish! Cut out a butterfly shape. Makes butterflies as big as your paper and is a great cooperative/team activity. Caterpillar: supplies needed: popsicle stick, 8 mini pompom balls (colorful ones), glue, googly eyes. Each child gets a stick and glues pompoms onto it in a row. then glues two eyes at one end. Butterfly: supplies needed: coffee filters, food coloring, water containers, eye droppers, pipe cleaners. twist pipe cleaners around the middle of the coffee filter to pinch it together and make butterflies. fill small containers with colored water, use droppers to drip the color onto the coffee filter till it is colorful. let it dry. Science: you’ll need an empty toilet paper roll or paper towel roll. Stuff your coffee filter butterfly into the tube then talk about how a caterpillar eats and eats, cocoons itself into the roll then as you push it thru the butterfly pops out the other end. Use the story Eric Carr’s “Very Hungry Caterpillar” to make this activity even more enjoyable. I used real food and reenacted the story at home. My kids ate the food each time and wanted more! Great for snack time too! Partially fill a snack size bag with small torn ( or for cutting practice-let them cut up small pieces of paper) pieces of construction paper. Add some sequins and/or glitter and zip shut. Tie around the middle with a pipe cleaner, dividing it into wings. Very cute hung from the ceiling.